Galaxies are complicated. 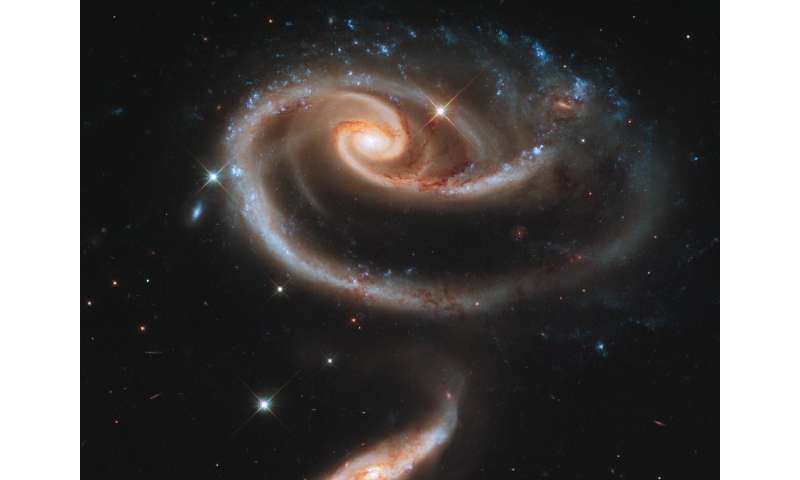 In this example, tidal interactions with a neighbour have distorted UGC 1810 to resemble a rose. This would be hard for automated programmes to fit. Credit: NASA/HST. Galaxy Builder is a new citizen science project from the University of Portsmouth, where volunteers reconstruct images of galaxies to help astronomers better understand how they formed and how physics has shaped their growth through their cosmic lifetime. The project is part of the Zooniverse, the world's largest and most popular citizen science web portal, owned and operated by the Citizen Science Alliance. It has been created by PhD student Tim Lingard from the University's Institute of Cosmology and Gravitation, aided and supervised by Dr Coleman Krawczyk and Professor Karen Masters, while working alongside the Zooniverse and supported by a Google Research Award. Spiral galaxies can be broken down into smaller building blocks: a thin galactic disc, a clumpy central bulge, a boxy elongated bar and winding spiral arms. Each of these building blocks can be roughly recreated using known equations. The problem is that galaxies are complicated, and when trying to use a computer to fit all of these building blocks, things are very likely to go wrong (and the image produced not representing the galaxy at all). Tim said: "This is why we need citizen scientists. Having a guide to make sure that the galaxy image being built properly matches the galaxy we're recreating will mean we can obtain mathematical profiles for the building blocks of more galaxies than has ever been achieved before, allowing the statistical study of physics like the driving force behind the creation of spiral arms in galaxies."